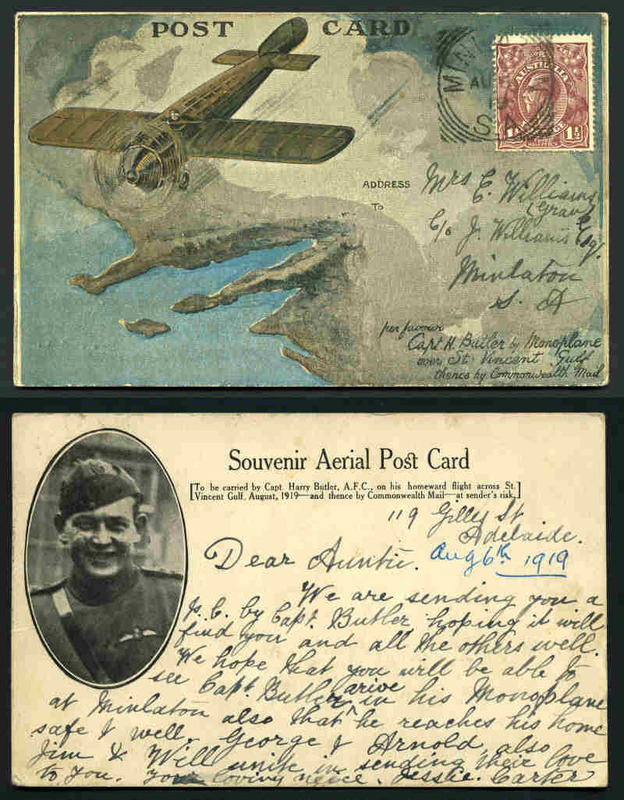 1919 Postcard showing view of plane over South Australia, flown by Harry Butler on his flight from Minlaton to Adelaide. AAMC 20a. 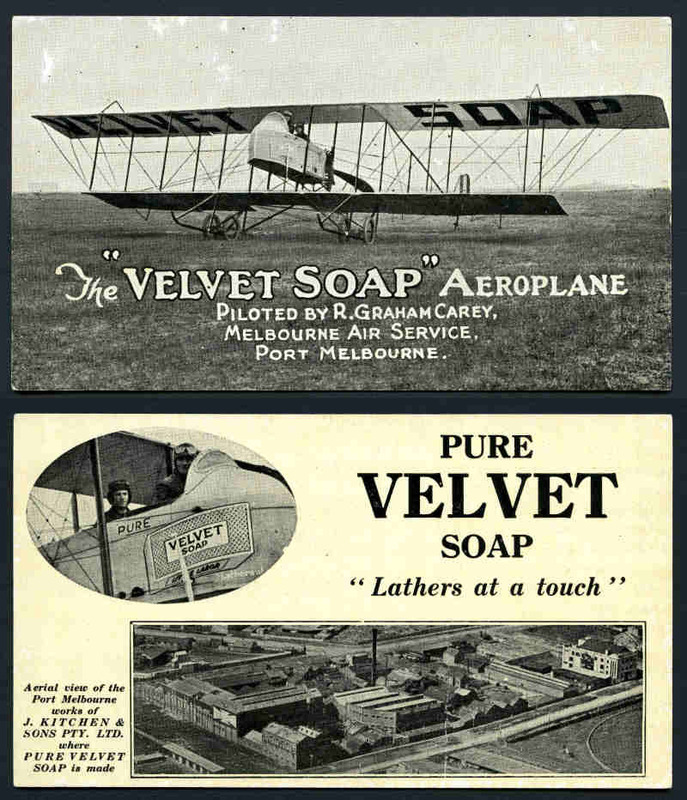 1920 "Velvet Soap" advertising postcard dropped over Melbourne by R. Graham Carey in his Maurice Farman Shorthorn biplane, as depicted on the card. 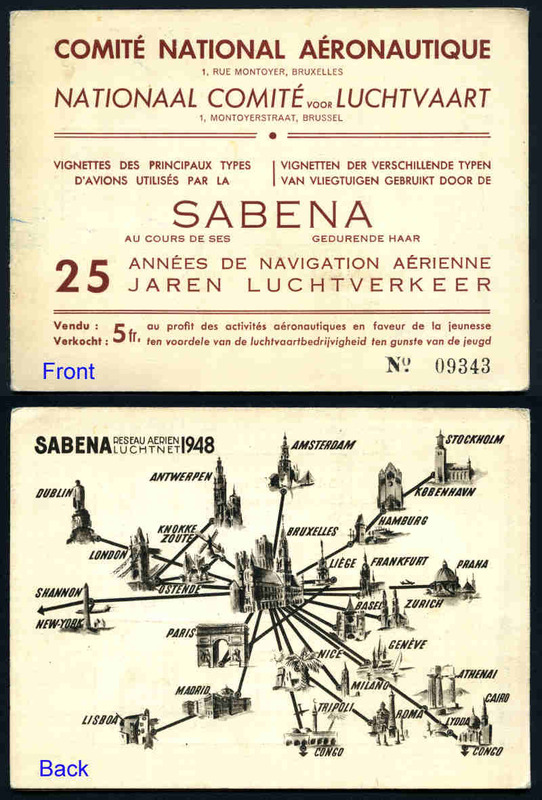 The reverse of the card shows Carey in the cockpit and an aerial view of the soapworks of J. 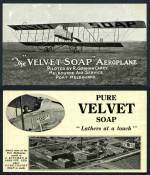 Kitchen & Sons, the manufacturers of Velvet soap. [Stated by Eustis "Only four cards known", presumably this is a fifth card]. AAMC 47c. 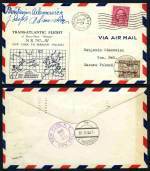 Selection of 49 First Air Mail Flight covers carried on flights to and from Australia or flights from within Australia from 1929 to 1947 comprising AAMC No's 136, 137 (2), 188, 188zi, 198, 198a, 206, 222, 245 (2), 296b (2), 367, 369 (3), 371, 390, 391 (2), 393, 395, 423, 469, 470 (2), 560, 561a, 581b, 707, 738b, 759, 760a, 808, 809 (2), 810 (2), 811, 812 (2), 820, 826, 899, 1066 (3) and 1113. Usual variable condition. AAMC Catalogue Value $2,835.00. 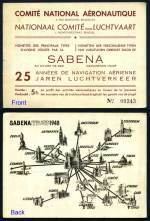 1948 Sabena Airlines booklet of 27 labels dated 1923-1948 featuring 9 different Aircraft printed in 3 different colours. Numbered 9343 and originally priced to sell at 5fr. 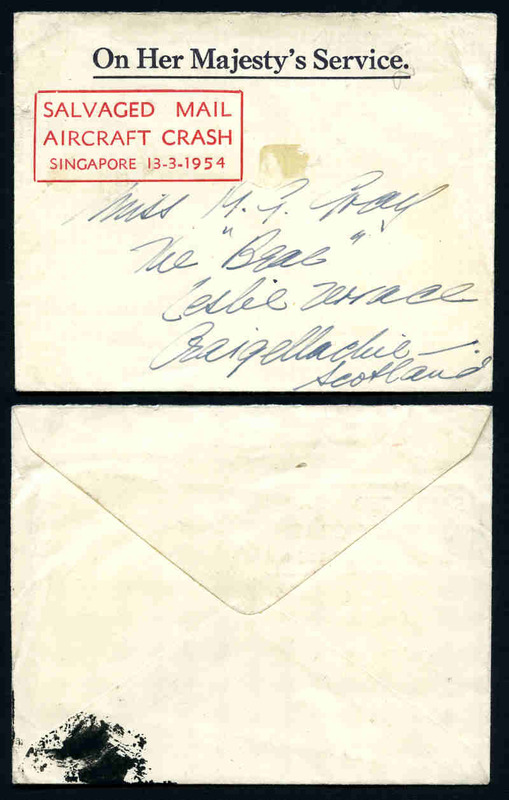 1954 Air Letter, 20% burnt, but recovered from the Wreck of the Constellation Aircraft "Belfast", that crashed at Singapore, together with a forwarding OHMS cover with printed cachet "Salvaged Mail Aircraft Crash, Singapore 13-3-1954" in Red. 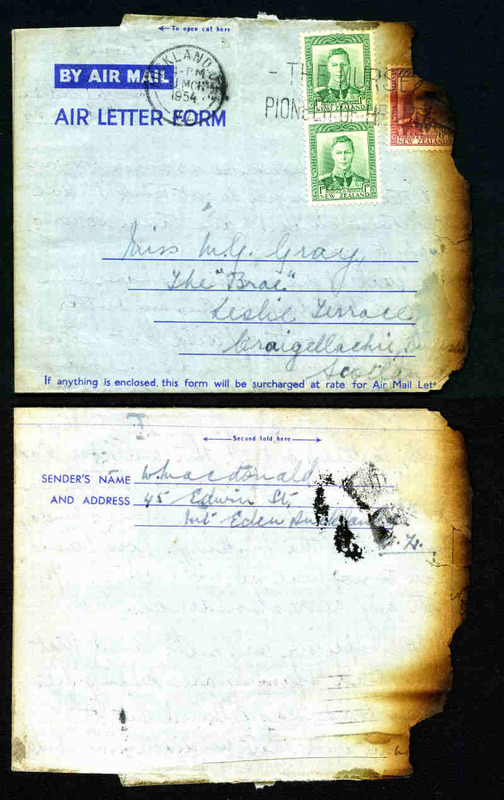 The Airletter was cancelled Auckland 11 March, 1954 and addressed to Scotland. OHMS envelope has a hinge mark on front. Stapleton 407. 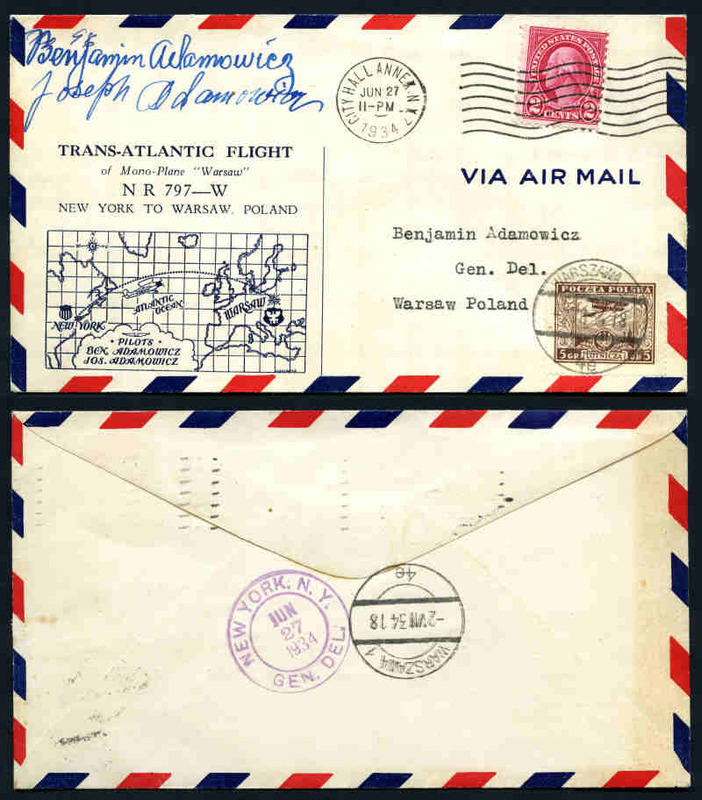 1934 Illustrated cover carried the Adamowicz brothers on their attempted nonstop Trans-Atlantic flight from New York to Warsaw, Poland. They were forced to land near Caen, but then continued the flight to Warsaw. Signed by Ben and Joe Adamowicz. 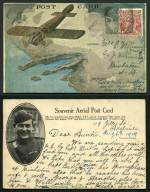 A rare cover with approximately 600 covers flown. Muller 398. 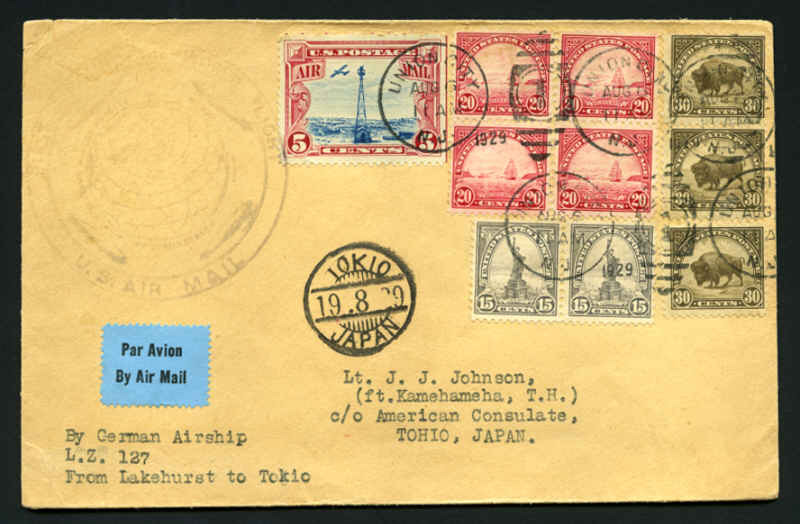 1929 First Round the World Zeppelin Flight cover from Lakehurst to Tokyo with official dispatch cachet. Fine condition. Selection of 91 First and Commemorative Flight covers from 1929 to 1981 from a range of countries with main strength in New Zealand, Pacific Islands, Great Britain and USA. 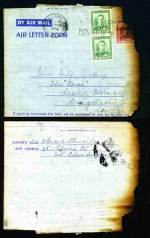 Noted 1931 Great Britain to Australia "The Machine" postcard and 1955 Qantas Airways First Flight cover from Singapore to Australia franked with 1955 QEII Definitive set of 15. Odd fault and several duplicates.